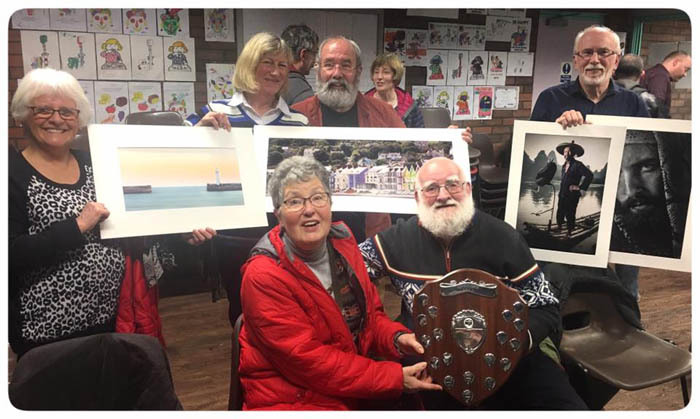 Ards Camera Club celebrated the culmination of the 2016-17 Season with its Annual Exhibition & Presentation of Awards at the Ards Arts Centre in the Town Hall, Conway Square. The judge and chief guest was Billy Leahey APAGB of BPIC Camera Club. The event was extremely well attended with all seats taken and even a few having to stand. On display were sixty framed and thirty unframed images together with forty-six projected images that were shown during the evening. The framed images will remain on public display in the Arts Centre until the end of May. Prior to the Presentation of Awards, Judge Billy Leahey entertained with his critique and comments on the images he had selected for the top placings. In the Colour Print Section 1st Place General went to Keith Malcolm and 1st Place Advanced to Ryan Patterson. In the Monochrome Print Section 1st Place General went to Richard Cowan and 1st Place Advance to Neal Ritchie. In the Projected Digital Image Section 1st Place General went to Chris Davidson and 1st Place Advanced to Sinclair Rusty Adair. The accolade of Top Print was awarded to Ryan Patterson for his image 'Dee by the Sea'. All the above and other placings can be seen noted on the images displayed in the Arts Centre. Also displayed was an Audio Visual presentation prepared by Sinclair Adair. A visual creation very much in the inimitable style of the 'Master' himself. Following a review of other collective and individual Club successes in various competitions during the 2016-17 Season, the Chairperson congratulated the successful authors and thanked everyone who had contributed in any way in the running of the Club and in the preparation for the Exhibition. The evening concluded with a great spread of refreshments, further viewing of the images, more audio visual displays from Club members and much conversation about the Exhibition. Many thanks to Billy Leahey for his judging input and also to the President of NIPA Vittorio Silvestri who congratulated the Club on the Exhibition and its work throughout the year. Last night of fun and entertainment, before the serious work of preparation for the Annual Exhibition on 5th May, with our (just for fun) Triptych & AV Competition. In line with all competitions this year, the entries in both categories was high. Both the Triptychs and AVs displayed an equal mixture of fun, abstract and 'normal'. It is amazing what can be created out of office stationery, little self assembly plastic people and oil on water! It was a night of self judgement and not a comment or complaint about the results was apparent! In the Triptych Competition Neal Ritchie scored a double with 1st Place for Mia's Friend and 2nd Place for Hong Kong Skyline and Irvine Ferguson was 3rd with his team of Lego bakers. In the AV Competition Linda Hutchinson also scored a double with 1st Place for Ali Adair (a take on the antics of the Club during the year) and 2nd Place for Boring Day (best not commenting on when or where that one was made) and Carol Watson was 3rd with a lovely AV of the Mountains of Mourne sweeping down to the sea. A lot of effort obviously went into creating the entries for both categories; thanks to all who took part and well done to the winners. The NIPA Novice Competition took place today in the Fountain Centre, Bangor. The Club had a number of members exhibiting their images and also it was good to see a large number of members there in support. The Club's successes in competitions continued with a Third Place and three Highly Commended Images. Keith Malcolm achieved Third Place in the Colour Section with 'Night Stalker' and Sian Kerr achieved Highly Recommended with 'Kathmandu Lady'. In the Mono Section both were successful again with Highly Commended Images. Sian with 'Neal' and Keith with 'Reflecting on the Dee'. Well done to both Keith and Sian on these well deserved achievements and a big thank you to the travelling and very vocal band of supporters. Also, thanks to NIPA for their obvious hard work in organising the event. The programmed presentations are now over and tonight was the most important business night of the year with the Annual General Meeting taking place. The Chair brought the attending members to order and outlined the procedure to stand down the current Committee and establish a new Committee in line with the Club's Constitution. In his Annual Report the Chair recounted the year's activities and competition achievements. In general it was a very productive and successful year and appreciation was expressed for all the work carried out on the Club's behalf both by the members and Committee. A special note of thanks was recorded for Chris Davidson who is standing down as Hon. Treasurer after five years in the position. A new Committee which consisted of the return of seven of the previous members and the addition of four new members was duly elected. It was agreed that this mix of personnel provided continuity, together with an influx of new ideas and enthusiasm, giving the opportunity to build on the success of this year. The evening concluded with a PDI display of images captured during the outings that were undertaken during the year. Tonight and it's the last in our series of member's presentations. Patricia Mackey and David Williamson provided us with a top quality display of Natural History and Travel Photography that stretched from Strangford Lough, up to the Arctic Circle, across a few continents to Africa and India, back to the Saltee Islands and home via the Duck Ponds at Kiltonga. Patricia is renowned for her Natural History images, many that have been placed and commended in various competitions. On show tonight was a diverse selection, including her favourite puffins, a variety of gulls, elephants, zebras, leopards, lions, otters and of course 'ducks', specially displayed for the knowledgeable camera club membership. Patricia also related the how, when and where the images were taken along with details of the equipment used. Although Natural History in content, it involved a lot of travel to record the many birds and mammals on show. Just returned from a holiday to India, David barely had time to process his photographs, but still provided us with a super photographic account of his visit, along with an insight into some of his early photographic journey. An account of his conversion from Canon to Nikon along with a collection of his early photographs that gave an insight into his passion for the technical side of the process was followed by a selection of his Indian trip. There were shots of temples, forts, palaces and lots of street photography that gave an insight into the people and their environment. Many thanks to Patricia and David for their presentations that were both entertaining and enlightening as they showed us some very impressive Natural History and Travel Photography. Ards Camera Club programme of events continued tonight with a visit from Paul Hanley who gave a presentation of his City and Architectural Photography. Paul is much travelled, whether visiting family, going on business trips or just going to take photographs, with the result that images taken in ten major cities ranging from Europe to USA were on show. Buildings taken from many diverse angles and featuring reflections from both glass and water were displayed together with internal shots of stairwells, walkways, substations and decorative ceilings. On this side of the Atlantic, Belfast featured with the iconic Titanic Building and City Hall, then there was Dublin with the Sam Beckett Bridge and reflections across the Liffey and Grand Canal Square. Across the Irish Sea to London and various images of the British and Natural History Museums, the Shard, St. Pauls, Tower Bridge and City Hall were shown. The English Channel was navigated next as the journey arrived in Paris where the Cupola of the Galeries Lafayette and the glass encased stairways and walkways of the Pompidou Centre featured. In Madrid, there was the Metropolis and staircase at the Ciaxa Forum and in Krakow the Cloth Hall with its impressive fountains and then on to Valencia where the Hemispheric and Opera House in the City of Arts provided architecturally futuristic elevations and reflections. Government Buildings in Berlin were next on show with their massive round windows, various reflections and the much photographed air vent in the dome of the Reichstag. The presentation finished with a trip to USA where 75th and Lex featured in New York and in Chicago we were shown images of the Pritzker Pavilion, the Cloud Gate (reflective bean) and the stairwell of the Museum of Contemporary Art. Many thanks to Paul for this presentation of his City and Architectural Photographic images that included many competition winners in this impressive top quality collection. 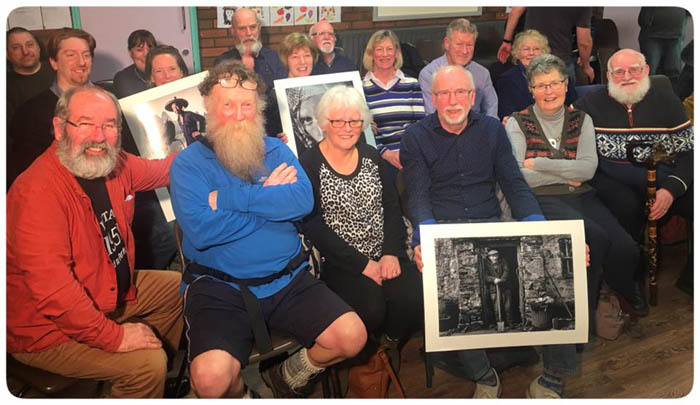 Not just St. Patrick's night at Ards Camera Club, but also the night when we showed our returned archive images from 50 years of NIPA competitions. Probably due to the on going green celebrations, attendance was down on previous weeks, however the display of old and not so old images provided much entertainment and nostalgia for those present. There was much reminiscing from Leslie Armour, Carol Watson and Mervyn Mackey as they were reacquainted with some of their own previous work and debated the work of other members from the same period. It was very interesting to observe and compare the differences in styles, composition and presentation as images shot on film 'developed' to images shot in today's digital format. The dark room was obviously every bit as potent as the computerised systems of today in post production manipulation. Thanks to Peter Knott for collecting the images and also for all his work as the club's NIPA representative. Tonight's Programme featured no less than eight members giving presentations that contained details of their journeys into photography together with displays of selections of their images. The group comprised beginners, new members and returning members with varying degrees of photographic experience and ability. First up was the double act of Jean Cross and Beryl Harvey who came along a few years ago to a beginners class and to the benefit of the club decided to stay. Not many beginners can claim that their first attempts at photography produced images that were suitably enlarged and displayed in the National Museum in Dublin. They showed copies of these images and explained that in conjunction with Belfast Exposed they got the opportunity and tuition to try their hand at photography which ultimately led to a trip to Dublin and display of two of their images. Also on display were other prints that clearly showed how their photography has progressed, especially Beryl's pet pheasant with the clipped tail. New member this year and complete beginner Sean Evans was next to display a selection of his prints. Sean has worked very hard with attendance at various photographic and photoshop classes together with lots of help and encouragement from other club members. His approach was to display images from his early attempts compared with the images he is now producing. The improvement was very apparent and showed the benefit of his hard work and dedication. Particularly impressive was the print of Sunset Over Scrabo. Sian Kerr, another relatively new comer to photography, was next to detail her photographic journey by way of a range of projected images. These commenced with novice rock climbing at Fairhead that convinced her that photography would be a better option for a hobby and continued with travel shots in Nepal, family at home and a prize winning image of her camper van under some eye catching star trails. Sian has developed into a very competent photographer this year with many images going through to the adjudication stage in NIPA Competitions. Raphael Clarke, the understated, talking, photographing, former postman who takes what he likes and likes what he takes, completed the first half of the evening with a display of a selection of his photography. He related how an impressive image of a spider nearly caused him physical injury due to its location on his garden shed. His other prints showed a diverse array of subject matter and also highlighted his trade union tendencies. New member to the club, Keith Malcolm recommenced the evening with a display of projected images that clearly showed his former teaching credentials and interest in conservation issues. His display of natural history photography had many superb images and had a special feature that ranged from a plastic duck to a real duck to a 'strange mind numbing lame duck'. It was clear that Keith is fast developing a 'Sinclairesque style of fun and mischief' in his photography. Returning former member Ryan Patterson continued the presentations with a projected display of before and after images. The images showed the as taken version and then the processed version with explanations of the necessary work undertaken. The 'giraffes' in Belfast Lough and the dawn image of Donaghadee Harbour were particularily stunning. Ryan then showed some of his images taken at various music gigs, a difficult subject to photograph, given the dark back lighting conditions, yet expertly captured. Our penultimate presenter was Richard Cowan. New to the club, Richard explained that injury forced him to give up fell running and cycling and turn his attention to photographing the events instead. The transformation from competitor to photographer was obviously very successful with many accomplished images of both events. Sports photography then turned to portraiture, with lovely images of his daughter who obviously liked posing for the camera and a particularly well taken image of a recent studio model. Jenny McCrea completed the evening with an account of her journey into club photography. Jenny has always been a taker of photographs and displayed the various cameras she has used as well as the resulting images taken with them. The images covered a diverse range of topics and ranged world wide from Hong Kong to Castle Espie. In her second year at the club Jenny displayed her ever developing ability and eye for something different in her compositions, resulting in two images being placed in NIPA Competitions. Many thanks and very well done to the eight members who took part in presenting their images and telling the stories of their journeys in photography. It is very encouraging to the Committee to have such willing participants and dedicated club members. A very successful and entertaining evening in the club's programme of events. A new month and Ards Camera Club's Programme of guest speakers continued with a double act, courtesy of two of Ballynahinch Camera Club's finest photographers. Frances Price and Peggy Turner gave accounts of their respective photographic journeys to obtain their LRPS qualifications. They were ably assisted in the technical stuff (operating the laptop) by Frances's daughter Katie. Frances commenced the presentation by explaining how she progressed from having a general interest in photography, to joining Ballynahinch Camera Club and ultimately progressing to the distinction of LRPS. A projected display of images demonstrated both how the process works and the selection process to assemble the final panel of ten that was presented for consideration. The actual panel was then displayed to show the obvious balance that is required to unite a diverse collection of images into an overall composition. Peggy then presented her LRPS panel and provided more information about the workings of the Royal Photographic Society as well as the process she undertook to create her ten images. To show that the presentation of images varies, it was noted that the photographs were double mounted to give more depth to their display. Having worked in the travel industry, Peggy's panel also displayed an overseas flavour with many colours demonstrating the warmth of the climate where they had been taken. Thanks and well done to Frances and Peggy who gave very accomplished presentations of their excellent LRPS panels. They provided much information and inspiration to those club members who are considering taking this photographic path. Ards Camera Club's Friday Programme continued with the NIPA Round Five Competition entitled 'Bad Weather', an ironic title considering 'Doris' raged and blew down one of the most photographed trees on the Planet during the previous day. The Dark Hedges are now a shade lighter. Raymond Hughes of Merville Newtownabbey Photographic Club accepted the daunting task of judging this competition with its diverse interpretations of what may constitute 'Bad Weather'. The task for home based photographers was made extremely difficult considering that since the competition was announced, there have only been a few episodes of what could be positively called bad weather, opined the Chair. There were a lot of excellently composed and photographed images that gave hints of pending and passed weather episodes, together with many of 'ordinary seasonal' weather. However, those that more or less met the brief included rough seascapes, sheltering from or getting soaked by heavy rain, heavy rain through glass, splashes and reflections in large deep puddles and misty and/or cloudy conditions. After much consideration and good humoured exchange with the audience, Raymond placed the images of the following members:- Sinclair Adair, Raphael Clarke, Martin Conroy, Chris Davidson, Dom Hannon, Sian Kerr, Jenny McCrae, Ted McKee, Neal Ritchie and Brian Widdiecombe. Congratulations to those successful entrants and well done to everyone who took the time, made the effort and endured the expense of preparing and entering their images. Many thanks to our brave judge Raymond who had the unenviable task of giving consideration to the many interpretations of 'Bad Weather'. This was the last NIPA Competition of the year and although there were fewer entries for this one, entries for the other four averaged well over one hundred and were placed by a large number of club members. Well done to everyone for the number and quality of their images submitted during this very well supported year of NIPA Competition. Our popular members' presentations reached installment four tonight with Vice Chair John McKernan and returning member Brian Widdicombe taking to the stage. When announced, the titles for the presentations were the source of much speculation. Brian called his 'Brian's Eye' and John raised the question 'Does size really matter'? First up was Brian and it was immediately obvious that his approach to explaining the rational behind his images was not in accord with the usual textbook format. We were presented with a personal philosophical reasoning of how Brian sees life through the lens of a camera ('Brian's Eye'). The whys and wherefores of subject matter, composition (especially relative to space), size of print, positioning in/on the mount and framed or frameless were examined, explained and frequently discussed with club members. An interactive approach was used to explain and examine the conscious and subconscious thought process that governs the reasons for what we photograph. Naturally it was all backed up with images to highlight the explanations. Brian's presentation provided everyone with different dimensions to think about the next time they pick up their cameras. Next up was John amid much conjecture on the question, 'does size really matter'? The basics of photography that we all take for granted were presented and examined together with the technical specifications that various camera types have to offer. John charted the array of various cameras he has used, from small size roll film in his first ever camera through to the compact system cameras he uses today. The question at hand was beginning to be answered when John pointed out that like many other photographers he has replaced his large heavy DSLRs with their accompanying array of large heavy lenses with smaller lighter mirrorless cameras. This in turn led to the discussion of the relationship of pixel numbers and sensor size relative to ultimate print size and quality in comparison to the various camera types and their technical specifications. John showed many images taken on different cameras, including panoramas that were extracted from standard size images. The debate could continue, but most concluded that size does not need to matter! It was a very intriguing and entertaining evening. Thanks and well done to Brian and John who obviously put a lot of time and effort into the preparation of their presentations. Our programme of events continued tonight with the third instalment of presentations by club members. First on show was the natural history work of Ted McKee. Everyone knows of Ted's many competition successes in this category of photography, so it was great to see and hear about his early photography and the many other images of equal competition quality. Birds, squirrels and insects were in abundance. The birds were photographed in such diverse places as his garden, Strangford Lough and the Saltee Islands in the South East corner of Ireland. Also on show were the butterflies, dragonflies and damselflies that have become a trademark of Ted's photography. However, the stars of the presentation were the red squirrels in Mount Stewart, a brilliant display of these endangered and endearing little creatures. The mid-evening break featured a cake with many candles to celebrate the birthday of club member Sinclair Adair whose interest in all things photographic remain unabated at the age of 93. Happy Birthday Sinclair from everyone at Ards Camera club. After the birthday celebrations, Linda Hutchinson provided an insight into her approach to photography, together with a photographic account of her cycle trip through Scotland in May 2016. First on show was an eclectic mix of photographs taken with various cameras and her iphone and even sometimes assisted by some digital manipulation. The photographic account of Linda's cycle trip commenced in Bangor, progressed along the Antrim Coast, crossed the Irish Sea (by boat), then followed the Sustrans Cycle Route up the West Coast of Scotland to Oban, on to Fort William and then to Inverness. Encouraged by unusually good weather, Linda then turned left and headed for John o'Groats and as a little extra kept going to have a look at the Orkney Islands. The photographic account and narrative of this epic journey was of exceptional quality and would have graced the pages of any travel brochure. Many thanks to Ted and Linda. Both presentations displayed great photography and contributed to a very entertaining evening. Friday 27th January and competitions continued with the NIPA Round 4 Open Category Competition. Our guest judge for the evening was Billy Leahey from Belfast Photo Imaging Club. As usual this season, there was a very good attendance and a large entry list with over 100 images on view over all categories. After Billy had passed his expert eye over the diverse array of prints and PDIs, the following members had their entries selected to go forward for consideration at the overall NIPA Round 4 Adjudication:- Rusty Adair, Martin Conroy, Chris Davidson, Sian Kerr, Keith Malcolm, Ryan Patterson, Arthur Richmond and Neal Ritchie. As usual, the standard of photography and presentation was of the highest order. It was good to see some new approaches to presentation with frameless prints, surface mounting and even a trapezoidal shaped image. Well done to those who had images selected and also thanks and well done to everyone who entered and supported the competition. Thank you to Billy, who took the time to comment on every print and PDI on display. His observations, comments and advice were well noted and has given everyone lots to consider and discuss at the review of this competition on Wednesday evening. Next Friday, 3rd February, is selection night for the annual Print Battle with City of Belfast Camera Club. As we are trying to get as many members as possible represented, entry is two prints of any size per member. Friday 20th January and there was a change to the published programmme when former member Daria Casement (Dee to her friends and most others) agreed, at short notice, to give a presentation of her journey into photography. Dee is also well known in local circles for her photography classes and some of her current and former 'pupils' are now members of Ards Camera Club. Dee's presentation included a display of her early work taken as project studies for various qualifications. This display was followed by further images taken at various times, up to the present day, to show and contrast, how her photography has progressed and developed. Also, there was reference to various photographers and their work that has influenced her thinking and approach. Dee completed her presentation with images of her involvement at Titanic Quarter, including photographs of the Drawing Offices prior to reconstruction and photographs of the recently restored HMS Caroline. It was great to see Dee back at the club and many thanks to her for providing a most interesting presentation, especially at such short notice. Our Programme continued on Friday 13th January with a presentation by club member Sinclair Adair. Always one of the highlights of our year, the presentation by this renown photographer and AV creator was eagerly anticipated. In consideration of Sinclair's usual display of creativity and imagination, the assembled members were prepared to be amused, bemused, confused, bewildered, puzzled, charmed, delighted, captivated and mainly entertained. As usual, Sinclair provided a masterclass, with anecdotes, photographs and audio visuals that included items covering personal, family, The Queen, Dracula, fly catching, space travel, double aspect landscapes, Chinese cormorant fishermen and much more on other diverse topics. A big thank you to Sinclair, It was a night of much laughter and entertainment, inspirational and very much appreciated by everyone. Well done to Alan Reid and Neal Ritchie at the Will McCrum Memorial Large Format Portraiture Competition tonight. Alan's image of 'Sam' was placed Third overall and Neal's image of 'White Beard at Work' was Highly Commended. An excellent result for our two club members to achieve such high recognition in competition with 94 other top quality images. Also, thanks and well done to CPA for their hosting of this very popular competition. Friday 6th January 2017 and after a few week's break for Christmas festivities our programme of events resumed with the NIPA Round 3 Competition on the theme of 'Textures'. Anne Given from Catchlight Camera Club provided the judging expertise on this much debated theme. There was a very good attendance and a large entry list with some 110 images on view over all categories. After much deliberation and good natured exchange with some of our more discerning club members, Anne selected images from the following entrants to go forward for consideration at the overall NIPA Round 3 Adjudication:- Sinclair Adair, Martin Conroy, Irvine Ferguson, Dom Hannigan, Sian Kerr, Ted McKee, Arthur Richmond and Neal Ritchie. As always, the standard of photography and presentation was of the highest order. Well done to those who had images selected and also thanks and well done to everyone who entered and supported the competition. Wednesday 11th January and we will review and discuss the entries from this competition. Saturday 3rd December and The Roy Finlay Natural History Competition took place at The Oxford Island Visitor Centre. There was good support by Ards Camera Club and it proved to be a successful event for three of our members. Patricia Mackey's print 'Zebra' and Keith Malcolm's print 'The Kiss' received commended status and in the PDI section Ted McKee achieved commended status for 'Green Veined White Butterfly' and highly commended status for 'Gannets' and 'Emerald Damselfly'. This was an excellent result for Patricia, Ted and Keith and for the club to have three members achieve such high recognition for their work. Thank you also to Rosemary Snodden for her continuing support for this popular event in the NIPA calendar. Friday evening 2nd December was Auction Night when an eclectic mix of items was assembled for disposal to the highest or any bidder. The items ranged from high and low end photographic equipment to a dozen eggs and much else in between! It was a very successful event, everyone had a great time and the club benefited financially. A very big thank you to Leslie and Patricia for their input and to everyone who contributed in any way to this very successful and enjoyable evening. Massive thanks to our chairperson Irvine Ferguson and Peter Knott for sharing their photography with the club. It is great to see such talent and hear the stories behind their images. Friday 11th November and our much anticipated event featuring award winning photojournalist Joyce Ferder Rankin took place at The Londonderry Park Pavilion. On the agenda was Joyce's photographic and campaigning work covering the effects of climate change on wildlife and the environment at the Arctic and Antarctic. During the first half of the programme, photographs of the animals that inhabit these areas were on display, including polar bears, penguins, seals, walrus and whales. Also photographs of barren rocky ground where previously there had been ice fields clearly illustrated the effects of global warming. Following a break for refreshments, the second half of the programme commenced with a short film that Joyce is currently working on and will ultimately be aimed at educating school children. The evening then continued with some lively debate during a spell of questions and answers with the audience. The images on display and the passionate campaigning of Joyce was certainly engaging, educating, challenging and thought provoking in regards to the issue of climate change. Many thanks to Joyce for being our guest speaker and sharing her photographic work that so graphically illustrated the problems that areas of the planet currently face. Also, a big thank you to everyone who contributed and helped in any way to stage this event. Friday night 4th November and our programme continued with a visit from the 'President'. Vittorio Silvestri, President of NIPA, was our guest speaker and provided us with a presentation of photographs from his trips to Prague and Iceland. The visits to each of the locations were illustrated with a detailed selection of projected images together with the narrative of how and where they were taken. The images for both Prague and Iceland were then supplemented with panels of twenty selected prints. Seeing prints of such excellent quality added an extra dimension to the journeys on display. Our thanks goes to Vittorio for a very enjoyable and entertaining evening. The NIPA Round 2 Open Competition took place on Friday 28th October with Damian McDonald passing judgement on the large number of entries in all categories. Prior to the start of this competition, David Williamson provided the club with a projected overview of the top ten PDIs from the recent Quadrangle event before announcing the much awaited and anticipated result. It was a resounding success for Ards Camera Club as we retained our title of Quadrangle Champions. Well done to everyone who competed and also those who helped organise this event. For the NIPA Competition, there were so many quality images on display that judge Damian McDonald acknowledged he was finding selection very difficult. After prolonged consideration, the following members had images selected to go forward for consideration at the overall NIPA Round 2 Adjudication:- Sian Kerr, Ted McKee, Carole Watson, Martin Conroy, Leslie Armour, Ryan Patterson, David Williamson, Richard Cowan and Richard Holmes. Many thanks to Damian who as well as judging, provided lots of advice and many useful tips on various aspects of photographic competition. Also, well done to the club members who had entries selected. Next Wednesday, 2nd November, we will have an informal overview and discussion of the competition entries and a look at any images from our challenge to take some Halloween themed shots. On Friday 21st October, Ards Camera Club hosted the NIPA Round One Competition Adjudication at Londonderry Park Pavilion. The event was a great success, both in the organisation by the club and then in the achievements of two of our members. Neal Ritchie was awarded the accolade of top colour print for 'White Beard at Work', a photograph of a Chinese cormorant fisherman and Ted McKee's PDI of an 'Orange Tip' butterfly achieved a starred print grade. Well done to Neal and Ted and thanks to all the club members who attended and helped in the running of this adjudication. A reminder to club members that the Club / NIPA Round Two Competition is on Friday 28th October, so all images requiring printing and mounting through the club should be made available before Wednesday 26th October and all PDIs should be sent to Peter Knott also by Wednesday 26th October. Friday 28th October is also the hand in date for the Roy Finlay Competition. Friday 7th October and our visiting guest speaker was Raymond Hughes from Merville Newtownabbey Photographic Club. Raymond who is an accomplished Audio Visual Photographer gave a presentation of a selection of his work including some of his many award winning productions. Various places and events were on display with photography from The Botanic Gardens, Londonderry, River Lagan, Auschwitz, The Tall Ships, First World War and even a Ploughing Competition to name just some from Raymond's collection. The accompanying music and commentary added an interesting, entertaining and sometimes thought provoking dimension to this aspect of photography. Friday 30th September and our guest was Eileen McCausland from Dungannon - Cookstown Camera Club. Eileen gave a presentation of black and white portraiture together with her AIPF panel of mono images and her ARPS panel of colour images. Portraits of many 'characters' from the Dungannon area as well as other studio and documentary portraits were on display with an accompanying narrative of how she engaged with the sitters and finally captured their image. Also, Eileen explained how she worked on the images and gave details about printing them. It was a masterclass on Eileen's personal approach to photographic portraiture, delivered with entertaining enthusiasm and much encouragement to both our novices and advanced members. A big thank you to Eileen for a most enjoyable, informative and motivating evening that was well received by everyone. Friday evening 23rd September and we had a very good attendance for the NIPA Round 1 Open Competition. The Guest Judge was Terry McCreesh who had a demanding task due to the large number of images entered and in his own words, 'the high quality of work on display'. Terry provided an opinion on every image, together with tips and advice especially to the group of new members who were competing for the first time. The images of the following members were selected to go through for consideration at the NIPA Round 1 Adjudication :- Rusty Adair, Dom Hannon, Sian Kerr, Patricia Mackey, Kieth Malcolm, Ted McKee, Alan Reid, Neal Ritchie and David Williamson. All the entries and placings will presently be posted on the club notice board. Naturally well done to the successful entrants, but also well done to everyone who supported the competition and obviously put a lot of effort into creating so many high quality images. Many thanks to Terry for his expertise in judging and the valuable feedback provided. Also, well done to 'Mystic Meg' Harvey who nearly predicted all of the successful entries! Just back from holiday having missed the first guest night of our new season. All reports indicate that last Friday Tom Fairley's presentation of his Photographic Journey was a superb first night opener. Tom's images included shots taken on visits to the Falkland Islands and Romania and a presentation of his ARPS Panel. Then he provided information on how he processes and prints his work at home. I am also reliably informed that he was accompanied and 'assisted' by Kieran Murray. Sorry I missed the night, but on behalf of the Club I would like to convey a big thank you to Tom for his visit and presentation of his photographic work. Back at the helm tonight and I had the privilege of introducing boxing legend and renowned press photographer Hugh Russell as he presented a selection of his images taken during the last 31 years. Hugh's work covered most of the important political and social events to take place in the province and further afield during that period. On show were images of American Presidents, Royalty, the current Pope, many of our local 'important' people and other photographs giving an insight to a more unfortunate side of our past. However, as always, humour was also always present and Hugh's commentary kept everyone entertained all evening. All technical issues were ably attended to by Hayley. it was greatly appreciated by everyone. This week sees the start of our 2016/17 season. For the first section of the evening we will be launching the new programme - discussing special events, highlights and competitions. After this we will be showing Audio Visuals put together by club members. If you have a slideshow/AV that you would like to show, please bring it along on a memory stick. It is always nice to see a good range of work (and we are not expecting competition quality) so if you can pull something together we would love to see what you have been up to over the summer. It promises to be a good night and there will be a range of snacks and drinks (both soft drinks and wine) available.